This weekend I was literally knocked off my feet, hit by a bad flu bug, it not only disrupted my entire weekend but will continue to wreak havoc with my week it seems…oh it has also left me a little grumpy 😦 Today coming out of the doctor’s office I stumbled upon a basket of kittens! Take that you nasty flu! Immediately my spirits lifted and I smiled, kittens the cure-all for any bad day. Kittens in a basket – I will take 3 please! The kind lady who was walking around with them explained to me that she had rescued a feral mom cat this past winter, which was particularly bad even by Canadian standards, and the little stray who was just a baby herself, turned out to be pregnant. So she had her babies – 3 beautiful sons pictured here, did an amazing job raising them and will be spayed and continue to live with her rescuer. 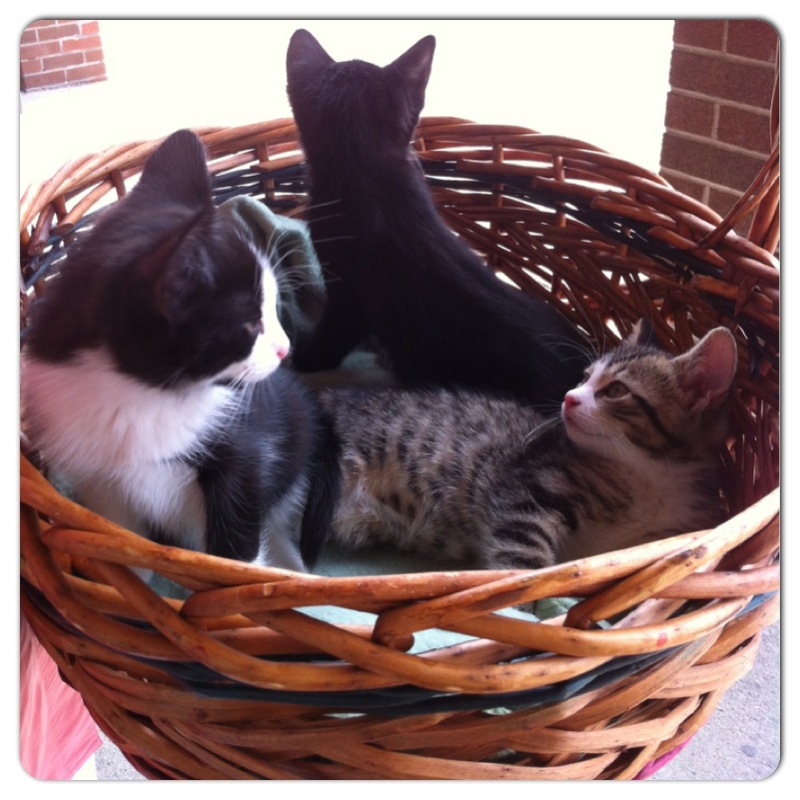 The 3 kittens, who were very relaxed and sleepy already had potential adopters waiting to take them home. 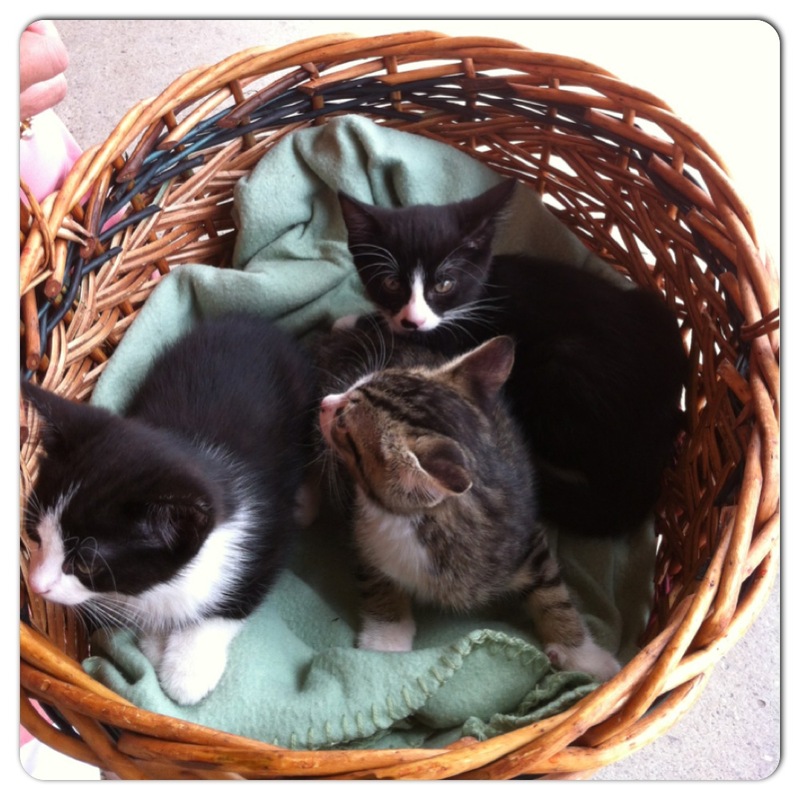 I will add that the kittens were very healthy looking, happy, safe and had no desire to leave their basket at any time. They were enjoying all the attention from passersby stopping, petting and just giving them lots of love. Clearly these babies had a good upbringing and human to look out for them. They didn’t know where to look! This entry was posted in Cat Rescue and tagged Cat adoption, kittens by Purr and Roar. Bookmark the permalink.